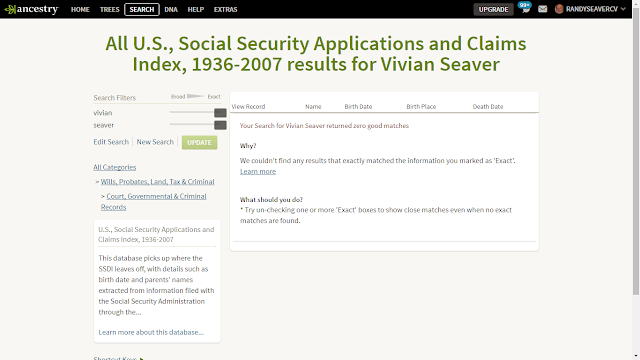 Aha, maybe there is a Social Security Applications and Claims Index entry that will provide a birth name, birth place, and parents names, not to mention marital history. Huh? No matches? But the search engine said there were three matches. What's up with that? 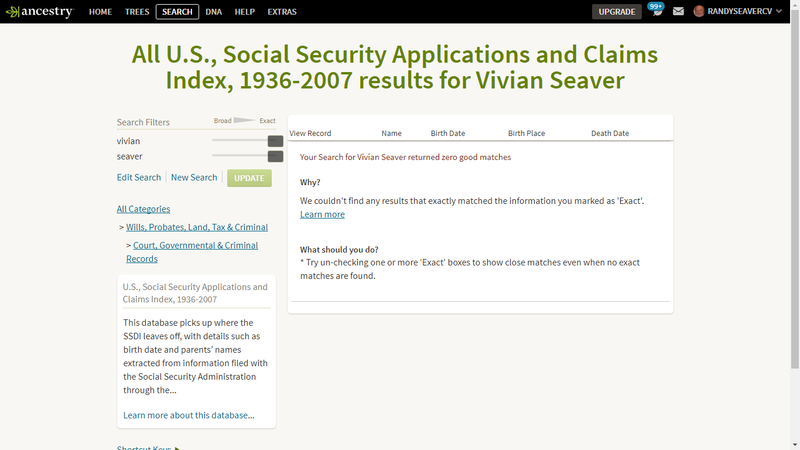 If I add a birth year, 1932 (broad), I get the same result - 3 matches in the Social Security database. If I make the birth year plus or minus 10, or 5, or 2, or 1 year, or exact, I get no results. It even happens when I move the slider to include initials for the given name - then there are 15 matches in the SSACI database, but I get a list of zero in the SSACI list. 4) Why doesn't this record show up in the "Categories" result on the search result page? This frequently happens to me when I search on Ancestry.com. I wish the search results would reflect what is in the indexed entries. Same thing just happened to me. I used a different path to get to the end result. I was aiming for the SS App collection after I had done a full search, so I whittled it down by using the left-side column, under "All Categories". I clicked on the "Wills, Probate, Land, Tax and Criminal" category and it said I had 18 hits for the SS App collection, but when I clicked the individual collection it only returned 5 results. Obviously, I could still get to those 18 records, but I had to weed through the other collections in the category. Something is not working. There should be an easier way to report this to Ancestry without having to make a phone call. Did you do this in the card catalogue. I often get this type of zero results, even when I tried to search for something I know thought I was doing something wrong. I just watched a video where the person placed the first name & birth year. Bingo tge result popoed up. It was to do with an incorrect transcribing of the actual records. Given some of the results I see it seems people can't read cursive writing very well. Interesting topic. 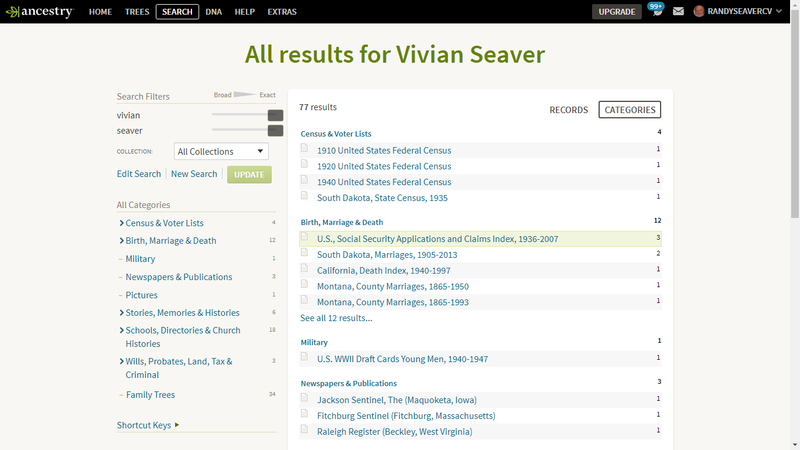 1) The search result number is the number of times the surname appears in the collection, not the number of records. 2) If the surname you're searching for is not in the primary name field on any of the records, when you click through to the search results, you get no records found. 2. Results say 67 records found BUT when you click through the search results, only 42 records are returned. This is because there are 67 occurrences of the surname Gualco, not 67 records, and the search results only returns those records where Gualco occurs in the primary name field. All told there are 47 records where the surname Gualco appears at least once five of which don't show up when you click through to the results, which brings me to issue #2. 1. Search "Social Security Applications and Claims Index" for "Vivian Seaver." 2. Results say 3 records found BUT when you click through the search results, no records are returned. 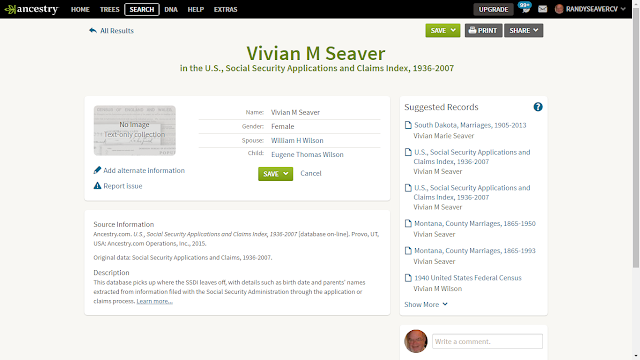 This is because Vivian Seaver appears in the mother's name field on three records, not in the primary name field.